A pulmonary alveolus (plural: alveoli, from Latin alveolus, "little cavity") is a hollow cavity found in the lung parenchyma, and is the basic unit of ventilation. Lung alveoli are the ends of the respiratory tree, branching from either alveolar sacs or alveolar ducts, which like alveoli are both sites of gas exchange with the blood as well. Alveoli are particular to mammalian lungs. Different structures are involved in gas exchange in other vertebrates. The alveolar membrane is the gas exchange surface. Carbon dioxide rich blood is pumped from the rest of the body into the capillaries that surround the alveoli where, through diffusion, carbon dioxide is released and oxygen is absorbed. The alveoli are located in the respiratory zone of the lungs, at the ends of the alveolar ducts and alveolar sac, representing the smallest units in the respiratory tract. They provide total surface area of about 75m2. A typical pair of human lungs contain about 480 million alveoli, producing 70m2 of surface area. [clarification needed] Each alveolus is wrapped in a fine mesh of capillaries covering about 70% of its area. An adult alveolus has an average diameter of 200 µm, with an increase in diameter during inhalation. 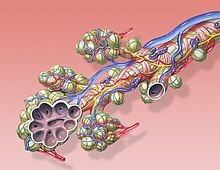 The alveoli consist of an epithelial layer and an extracellular matrix surrounded by small blood vessels called capillaries. In some alveolar walls there are pores between alveoli called Pores of Kohn. The alveoli contain some collagen fibers and elastic fibers. The elastic fibres allow the alveoli to stretch as they are filled with air during inhalation. They then spring back during exhalation in order to expel the carbon dioxide-rich air. There are three major types of cell in the alveolar wall: two types of alveolar cell (also called pneumocytes) and a large phagocyte known as an alveolar macrophage. Type I cells are thin and flat and form the structure of the alveoli. Type I alveolar cells are squamous (giving more surface area to each cell) and cover approximately 90–95% of the alveolar surface. Type I cells are involved in the process of gas exchange between the alveoli and blood. These cells are extremely thin (sometimes only 25 nm) – the electron microscope was needed to prove that all alveoli are covered with an epithelial lining. These cells need to be so thin to be readily permeable for enabling an easy gas exchange between the alveoli and the blood. Organelles of type I alveolar cells such as the endoplasmic reticulum, Golgi apparatus and mitochondria are clustered around the nucleus. The nuclei occupy large areas of free cytoplasm. This reduces the thickness of the cell, thereby reducing the thickness of the blood-air barrier. The cytoplasm in the thin portion contains pinocytotic vesicles which may play a role in the removal of small particulate contaminants from the outer surface. In addition to desmosomes, all type I alveolar cells have occluding junctions that prevent the leakage of tissue fluid into the alveolar air space. Type I pneumocytes are unable to replicate and are susceptible to toxic insults. In the event of damage, type II cells can proliferate and differentiate into type I cells to compensate. Type II cells secrete pulmonary surfactant to lower the surface tension of water and allows the membrane to separate, therefore increasing its capability to exchange gases. The surfactant is continuously released by exocytosis. It forms an underlying aqueous protein-containing hypophase and an overlying phospholipid film composed primarily of dipalmitoyl phosphatidylcholine. Type II alveolar cells cover a small fraction of the alveolar surface area. Type II cells are also capable of cellular division, giving rise to more type I and II alveolar cells when the lung tissue is damaged. These cells are granular and roughly cuboidal. 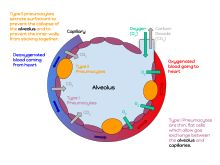 Type II alveolar cells are typically found at the blood-air barrier. Although they only make up <5% of the alveolar surface, they are relatively numerous (60% of alveolar epithelial cells). The alveolar macrophages, also called dust cells, destroy foreign materials and microbes such as bacteria. The cross section of an alveoli with capillaries is shown. Part of the cross section is magnified to show diffusion of oxygen gas and carbon dioxide through Type I pneumocytes and capillary cells. Type I cells are thin, flat cells lining the alveolar walls. Each alveolus is surrounded by numerous capillaries, and is the site of gas exchange, which occurs by diffusion. The relatively low solubility (and hence rate of diffusion) of oxygen necessitates the large internal surface area (about 80 square m [96 square yards]) and very thin walls of the alveoli. Weaving between the capillaries and helping to support them is an extracellular matrix, a meshlike fabric of elastic and collagenous fibres. The collagen fibres, being more rigid, give the wall firmness, while the elastic fibres permit expansion and contraction of the walls during breathing. Type II cells in the alveolar wall contain secretory granular organelles known as lamellar bodies that fuse with the cell membranes and secrete pulmonary surfactant. This surfactant is a film of fatty substances (the majority of which are dipalmitoylphosphatidylcholine), a group of phospholipids that reduce alveolar surface tension. The phospholipid are stored in the lamellar bodies. Without this coating, the alveoli would collapse and very large forces would be required to re-expand them. Type II cells start to develop at about 26 weeks of gestation, secreting small amounts of surfactant. However, adequate amounts of surfactant are not secreted until about 35 weeks of gestation - this is the main reason for increased rates of infant respiratory distress syndrome, which drastically reduces at ages above 35 weeks gestation. Type II pneumocytes can replicate in the alveoli and will replicate to replace damaged type I cells. MUC1, a human gene associated with type II pneumocytes, has been identified as a marker in lung cancer. Another type of cell, known as an alveolar macrophage, resides on the internal surfaces of the air cavities of the alveoli, the alveolar ducts, and the bronchioles. They are mobile scavengers that serve to engulf foreign particles in the lungs, such as dust, bacteria, carbon particles, and blood cells from injuries. Reinflation of the alveoli following exhalation is made easier by pulmonary surfactant, which is a phospholipid and protein mixture that reduces surface tension in the thin fluid coating within all alveoli. The fluid coating is produced by the body in order to facilitate the transfer of gases between blood and alveolar air. The surfactant is produced by the type II cells which are the most numerous cells in the alveoli, yet do not cover as much surface area as the squamous alveolar cells (a squamous epithelium). Type II cells also repair the endothelium of the alveolus when it becomes damaged. Insufficient surfactant in the alveoli can contribute to atelectasis (collapse of part or all of the lung). Without pulmonary surfactant, atelectasis is a certainty; however, there are other causes of lung collapse such as trauma (pneumothorax), COPD, and pleuritis. Cystic fibrosis is a genetic condition. A mutation of the cystic fibrosis transmembrane conductance regulator gene causes defective CFTR proteins, which are transmembrane proteins that function in Cl− transport in wet epithelia. Because wet epithelium is such a ubiquitous and multipurpose tissue type, CF has myriad deleterious effects, some of the most serious of which are severe respiratory problems. Many of the mechanisms by which CF causes damage or inadequate function in the wet epithelia of other tissues, such as the digestive and reproductive tracts, are well understood. CF's mechanisms in causing lung disease, however, remain poorly elucidated. One popular hypothesis suggests increased viscosity due to increased salinity of the mucus secreted by glands of the pseudostratified respiratory epithelium, causing difficulty in maintaining normal respiratory tract mucociliary clearance. The frequency of certain specific bacterial infections caused by Pseudomonas, Haemophilus influenzae, and Staphylococcus has prompted two other popular categories of hypotheses: that the high salt content may interfere with defensins and lysosome, and/or may encourage the growth of the several bacterial species typically infecting the ordinarily-sterile lower lungs of CF patients. Regular treatment is usually required—primarily percussive therapy and antibiotics. Promising research into gene therapies is taking place. ^ Hansen, J. E.; Ampaya, E. P.; Bryant, G. H. & Navin, J. J. (1975). "The Branching Pattern of Airways and Air Spaces of a Single Human Terminal Bronchiole". Journal of Applied Physiology. 38 (6): 983–989. PMID 1141138. ^ Daniels, Christopher B. & Orgeig, Sandra (2003). "Pulmonary Surfactant: The Key to the Evolution of Air Breathing". News in Physiological Sciences. 18 (4): 151–157. PMID 12869615. ^ C. Michael Hogan. 2011. "Respiration". Encyclopedia of Earth. Eds. Mark McGinley & C. J. Cleveland. National council for Science and the Environment. Washington, D.C.
^ Steve, Paxton,; Michelle, Peckham,; Adele, Knibbs (2003). "The Leeds Histology Guide". ^ "Alveoli: Gas Exchange and Host Defense". Functional Ultrastructure: An Atlas of Tissue Biology and Pathology. Springer Vienna. 2005. pp. 224–225. doi:10.1007/b137527. ISBN 978-3-211-83564-7. ^ a b Ochs M.; Nyengaard J. R.; Jung A.; Knudsen L.; Voigt M.; Wahlers T.; Richter J.; Gundersen H. J. G. (2004). "The number of alveoli in the human lung". American Journal of Respiratory and Critical Care Medicine. 169 (1): 120–4. doi:10.1164/rccm.200308-1107oc. PMID 14512270. ^ Roberts, M., Reiss, M., Monger, G. (2000) "Gaseous exchange." Advanced Biology. Surrey, Nelson. p. 167. ^ "Lung - Regeneration - Nonneoplastic Lesion Atlas". ntp.niehs.nih.gov. Retrieved 2018-05-18. ^ Fehrenbach H. 2001. "Alveolar epithelial type II cell: defender of the alveolus revisited." Respir Res.2(1):33-46. ^ Jarrard JA, Linnoila RI, Lee H, Steinberg SM, Witschi H, Szabo E (December 1998). "MUC1 is a novel marker for the type II pneumocyte lineage during lung carcinogenesis". Cancer Res. 58 (23): 5582–9. PMID 9850098. ^ Saladin, Kenneth S. (2007). Anatomy and Physiology: the unity of form and function. New York: McGraw Hill. ISBN 0-07-322804-4. ^ Britton, the editors Nicki R. Colledge, Brian R. Walker, Stuart H. Ralston; illustrated by Robert (2010). Davidson's principles and practice of medicine (21st ed.). Edinburgh: Churchill Livingstone/Elsevier. ISBN 978-0-7020-3085-7. 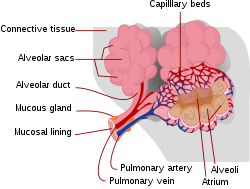 Wikimedia Commons has media related to Pulmonary alveoli.